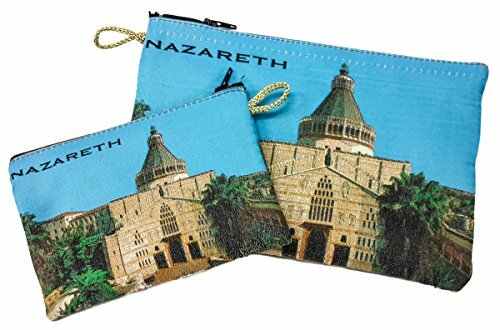 Set of 2 Cloth Tapestry Prayer Rosary Case With Nazareth Annunciation Church. Both Sides Identical The Pouch is Fully Lined and Feature With Nice Strong Zipper close Can be used as case, pouch bag or even a wallet, Unique Religious Gift From Holy Land. Big (H x W) 13.3 cm x 21 cm / 5.2" x 8.3" , Small (H x W) 9.6 cm x 14 cm / 3.8" x 5.7"
Can be used as case, pouch bag or even a wallet, Unique Religious Gift From Holy Land.